This post begins with a short review of the book that sparked this conversation, then introduces other period sources commenting on relationships between Army officers and Dakota women. I made progress on my to-read pile this summer, including several books that I purchased from the Brown County Historical Society last summer, when they were new releases for the 150th commemoration of the Dakota War of 1862. I found John LaBatte and Elwin Roger’s The New Ulm Pioneer and the Indians 1858-1862 (2012) engrossing and timely. As scholarship on the Dakota war continues to progress, we’re increasingly aware that the experiences and opinions people brought to the Dakota War influenced how they perceived and remembered events. The field sorely needs the Dakota War equivalent of Milton J. Bates’ The Wars We Took to Vietnam: Cultural Conflict and Storytelling (University of California, 1996). Until someone writes it, primary sources like the New Ulm Pionier articles LaBatte harvested will prod us to reconsider the stories we’ve inherited. The collection of newspaper stories is arranged in chronological order from January 1, 1858 (the first issue) through August 16, 1862 (the last issue printed before the war). LaBatte culled articles containing German keywords for Indians. Rogers, Professor Emeritus of German at Concordia College, Moorehead, MN, translated the articles into English. The 40-page book reproduces the English translations with spare, but adequate, annotations by the editors, and a short introduction and conclusion by LaBatte. 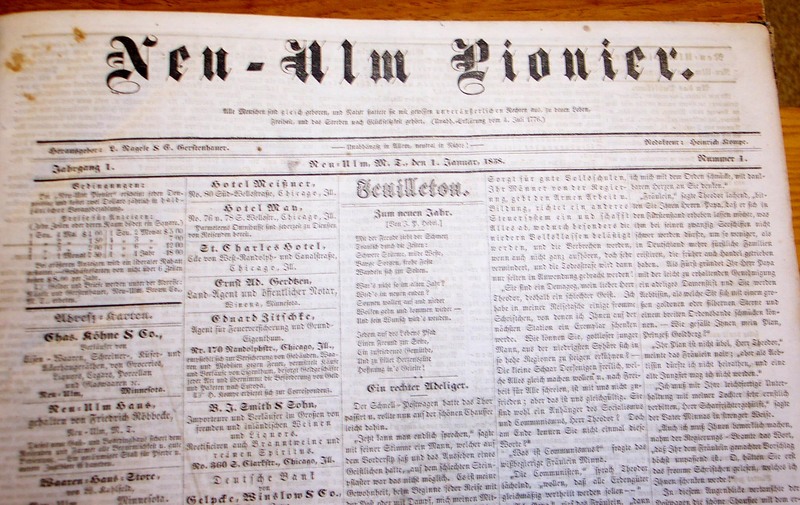 Despite the Pionier’s early motto, “Independent in Everything, Neutral in Nothing,” in these translations, the 19th century editors’ voices emerge as moderate compared to many of the declared-partisan editors of Republican and Democratic newspapers in this period (the Pionier editors were Republicans), and less racially biased than New Ulm citizens were stereotyped to be in the wake of the war. Readers expecting church-bashing from these dedicated Turners will be surprised to find the editors praising the work of the Presbyterian missionaries among the Dakotas. Anyone expecting to find pointed animus against New Ulm’s Dakota neighbors –the Lower Sioux Reservation began ten miles west of New Ulm –may be disappointed. While the editors’ racial views were no more enlightened than average (meaning they use language and express views that are offensive today), these articles show that regular Federal annuity payment cycles on the Dakota reservations, and on the Winnebago reserve southeast of New Ulm, made Native Americans welcome in the neighborhood economy. Further, New Ulmers leveraged the economic potential of their proximity to all three Indian reservations, and to the military reserve at Fort Ridgely, actively seeking Federal contracts for local farmers and businesses. But I enjoyed most the new perspective on the goings-on in Renville and Brown Counties, which surrounded the Dakota reservations. As with all newspapers, sometimes the neighborhood gossip turned out to be true, and sometimes it did not. But whether or not historians judge the news accurate, the reportage itself offers fresh insight into the prevailing beliefs that would take on added significance with the onset of the Dakota War in 1862. Like how close to New Ulm was the treaty-surveyed eastern boundary of the Lower Sioux Reservation? (Reports conflicted.) How many settlers squatted on land on the 10-mile strip of reservation land north of the Minnesota River between the treaty negotiation date of 1858 and its ratification in 1861? Did they have any right to be there? Perhaps even more telling, who had settled there before the treaty was even proposed, and how, legally speaking, did they do it? To give you a taste of these articles and the layers they add to previously known sources, I’ll quote a section of a July 13, 1861 article titled, “The City and Its Surroundings,” and in the next post, supply complimentary primary sources on the subject of relationships between military officers and Dakota women before the war. As in the South the black population is becoming paler and paler, here on the border the French Canadian and the Angloamerican are trying to bring the Caucasian blood into the majority of the native American [sic]. Instead of the dark brown tendency of the full blood Dakota, one frequently encounters the sallow color of the half caste and many a son or daughter of a rich, respected father live unknown in the Dakota villages and turn into a wild creature when the father could give his offspring the best and most excellent education. Few old sinners who served as US military officers or other officials who entered into a temporary marriage with one or more Indian women remember that they have the duties of a father. They are ashamed to introduce the light-colored children of a brown mother into the fashionable, well mannered and pious circle of their relatives and friends. The French-Canadians are better. Of course, they do not bring their brown companions nor their light-colored children up to their level, rather they are much more inclined to come down to theirs and let half-blood children become complete children of nature; but at least they do not desert of deny them. A short time ago, the missionary Riggs loosed a thundering letter [or sermon] against the white fathers of half-Indians who forget their duties toward them and noted that in the Dakota villages many children run around whose fathers served in the army or who had high posts under earlier administrations and who would have entree into the most fashionable society. These children are the product of marriages that, in Indian eyes, are completely justified and are therefore not bastards but legitimate children. Through a gift to the family of the woman, the father acquired the consent of her family members to take the woman he desired to himself. Perhaps they lived together for years in complete harmony until the white groom either grew tired of his companion or “forced by circumstances?”* gave her and her children permission to return to her friends. * Editor Elwin Rogers notes that the question mark is in the original German text. This entry was posted in Fort Ridgely, German Turners, New Ulm, newspapers. Bookmark the permalink. Interesting review and now I want to buy the book. Thanks! Jan, My copy is from the bookstore at the Brown County Historical Society in New Ulm, MN.